This essay, by Sidney Parker, first appeared in Minus One , No. 14 (July-August 1966). 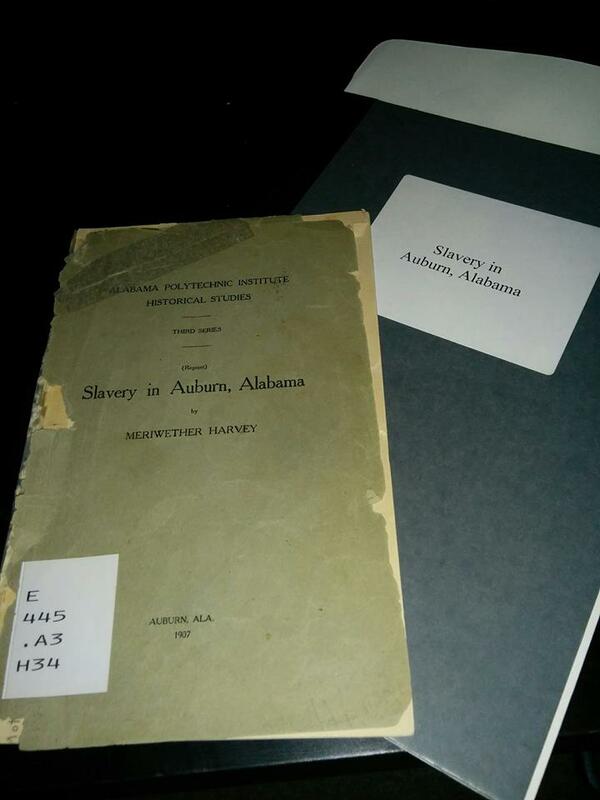 It has since been reprinted in Enemies of Society (Ardent Press), pp. 150-3, and in The Sovereign Self No. 4 (Jan 2012) pp. 6-8. The trouble with discussing socialism is that the word is such a vague one. Anarchism, in comparison, is clear and precise. An anarchist is someone who is without belief in authority–an individual who wants to live his life without having to submit to a will external to him. Anarchism is therefore the philosophy of living without authority, as its etymology suggests. The Little Oxford Dictionary is blunt: “Socialism: the principle that individual liberty should be completely subordinated to the community.” Professed socialists themselves, however, have eschewed such bluntness and the most contradictory doctrines have been labeled “socialist”. There have been and are, national socialists, Christian socialists, libertarian socialists, state socialists, Marxist socialists, spiritual socialists, idealist socialists and so forth and so on. The only way one can get any sense out of the bewildering confusion of “true interpretations” is to find some belief or principle common to all socialists which distinguishes them from other people. Since, for socialists in general, the economic question is paramount–every problem tending to be reduced to the abolition of capitalism and the establishment of socialism–there is one belief which all socialists, from Statists to libertarian communists, share, and that is the belief in the need to put the ownership or control of the means of production into the hands of some collective body, be it the government or “society”. Socialism above all is, as Auguste Hamon has said, a “social system in which — a social doctrine by which — the means of production are socialized”. It is my argument that this wish to make society the owner and provider of the means of life is to put new authority over the individual in place of the old and is therefore not anarchism. Anarchism stands for leaving each individual free to provide for himself what he needs and is therefore not a complement of socialism but its opposite. It follows that those anarchists who think that anarchism is a form of socialism are deluding themselves and sooner or later will have to choose between them, for they cannot logically be both. Undoubtedly there are some socialists who are genuinely concerned for the freedom of the individual and believe that by taking the means of production away from the capitalists and giving them to society, or the State as representative of society, they will abolish the subjection of the many to the privileged few and so secure the liberty of each individual. But how would this alter the position of the individual producer? Under capitalism he has to submit to the will of a handful of monopolists. Under socialism he would have to submit to the will of the collective. He would have no freedom to produce and exchange as he wishes and without this his individual freedom cannot exist. The socialist might reply that when the means of production belong to all then everyone will be an owner. But of what use is it to me to be an owner of something in common with, say, 1,000,000 people? To own one millionth of something is in effect to own nothing. Under socialism, therefore, the individual would be a proletarian–that is, a property-less person–and control of the means of production would be in the hands of an abstraction called “society”, and the interests of this abstraction would be superior to the interests of the individual. Everything would be for the “common good”. Socialism, being a species of humanism, is a doctrine of indiscriminate solidarity. It suppresses direct exchange between the producer and the consumer and has for its ethic the obligation of each to work for the benefit of all. It assumes that since each individual will have the right to a guaranteed living, he must all have the duty to put all he produces at the disposal of the collectivity. The producer cannot choose who will benefit from this production; the consumer cannot choose who will be his producer. Socialism is thus a herd-philosophy, the practice of the bee-hive. Its consistent application would deny all freedom of choice and it is therefore a totalitarian system. Even if in theory there would be no laws in a socialist society to enforce the subordination of the individual to the mass, there would be a socially sanctioned system of moral coercion to achieve the same end. Economic freedom — any kind of freedom — for the individual can only exist where there is a choice of alternatives. Anarchism can only be pluralist, allowing any kind of economic relationship that will satisfy the individuals involved. To tie the individual to collective ownership is not anarchism, for anarchism can only exist where there is the possibility for infinite change and variety. … who is to be the subject of the process of production, consumption and accumulation? Is it to be the individual, working as an independent economic unit–either alone or, if he chooses, in association with other individuals? Or is it to be the community as a whole, working as a sort of super-family, and necessarily incorporating the individual, who thus becomes a cell in a larger economic organism? Either the economy could be of such a nature that it necessitated association (and let us never forget that economic necessity can be at least as tyrannical as any government), or it could be based on the individual unit, leaving each individual free to associate, but never submerging him in any group from which he could not withdraw without economic ruin. … only a variation on the Marxist ideal that the State will ‘wither away’. there are no rulers in the Marxist paradise, which, in that sense, is an anarchist world. But the supposedly ‘free’ individual is merely a cog in a gigantic social machine, held together by sheer force of economic necessity. Where socialists go wrong in this matter is in their assumption that the individual can only be free–i.e. self-governing, self-owning–when his interests are combined with those of all other individuals. They believe in the collectivization of interests. But I am not free if my interests are inseparable from yours. My freedom lies in my opportunity to differ, in dis-unity, dis-connection, dis-sent. I am freest when interests are individualized, when I can be sole sovereign over my person and can dispose of the things I produce, or the services I can offer, as I see fit. Anarchism lies in the direction of the individualization of interests, economic or any other, not their socialization. Socialism is a religion of Society–it is the sacrifice of the individual to the Collective. Anarchism is the philosophy of the individual–it is the affirmation of individuality, the proud denial of legitimacy to any institution, group or idea that claims authority over the ego. –From Minus One , No. 14 (July-August 1966). Editorial Note. This is the text of an undated rich-text document retrieved (thanks to a Google Cache) on December 27, 2012 from a document-upload website. The text document identifies itself as an essay by the Anarchist writer Gary Elkin, on Mutual Banking. Gary Elkin is a contemporary anarchist writer, the author of several articles on individualism, anarchism, economics and ecology, and a listed contributor to An Anarchist FAQ . The document must have been written no later than 2002 (since it is cited in Carson’s The Iron Fist Behind the Invisible Hand but no earlier than 1994 (since it cites an Economist article from November of that year). The document was divided into two parts, but without explanation of the dividing line chosen. We have retrieved the document because a quote from this document is referenced in several works by the mutualist writer Kevin Carson, and unfortunately the full text of the document doesn’t currently seem to be available from any other source on the public Internet. The RTF documents were missing apparent footnotes and bibliographical material; if you have this, or if you have any information to help authenticate the date or authorship of the document, please contact us or leave a note in the comments below. –Editors, Fair Use Repository. Gary Elkin on Mutual Banking. This article discusses the idea of a zero-interest credit system, commonly known as “mutual banking,” which was first suggested by Pierre-Joseph Proudhon and later taken up by American individualist anarchists such as William B. Greene and Benjamin Tucker. We’ll first examine an anarchist analysis of the State which underpins the argument for mutual banking, then go on to see how an updated version of mutual banking, complete with Internet “e-money” transfer capability, would work in practice. land-and-buildings-monopoly, the basis of landlordism. Following Benjamin Tucker (1972), I’ll refer to income derived from such monopolies as “usury,” a term that may thus be defined broadly as the exaction of tribute for the use of any object whose artificial scarcity and monopolization by an elite class are created and protected by the State. This definition widens the usual meaning of usury to include not only interest but profits and rents as well. The State creates and sustains the first monopoly, of credit and currency, primarily through legislation that restricts allowable currency to a “legal tender” that can be issued only by the central bank. Banks (including credit unions, thrifts, etc.) are then required to transact all business — whether as cash, deposits, reserves, or extensions of credit (“loans”) — only in units of this currency. Moreover, in order to be granted a bank charter, numerous other conditions must be met, including the raising of a given amount of deposit capital in a specific period of time; proving to the banking authorities that another bank is necessary; showing that it has a viable chance of success, and so on (Morris and Hess 1974: 81). Such laws, and the interpretive lattitude given to those who enforce them, function effectively to restrict banking to an elite class whose members have enough “standing” in the financial community to raise the necessary capital and convince the authorities that the proposed new bank represents no threat to the overall system of finance-capitalist exploitation. Hence this elite class is able to maintain a monopoly over the power to issue money as credit, and hence to exact monopoly fees for its use. In turn, this State-protected monopoly of credit-issuing power is combined with other forms of action by the State (e.g. its protection of titles to unused and unoccupied land) in order to create further artificial scarcities: notably of land, buildings, and capital goods, which are expensive items that generally cannot be acquired without credit. These items are then also sold or rented out at high price by those who monopolize them. For example, the surplus value extracted by capitalists from workers can be viewed as a form of monopoly rent charged by those who own the means of production to those who need to use them to earn a living. Although all monopolies are detrimental to society, anarchists like Proudhon and Tucker have maintained that the credit-issuing monopoly is by the most pernicious. This is not to say that capitalists’ exploitation of labor or landlords’ exploitation of tenants are any less evil in themselves than bankers’ exploitation of debtors. It’s merely to say that monopoly of the power to create money as credit is the main root from which the other two monopolies grow and without which they would wither and die. For if credit were not monopolized, its price (i.e. interest rates) would be much lower, which in turn would drastically lower the prices of capital goods, land, and buildings. Therefore, if the State would stop protecting the credit-issuing monopoly — which is to say, if any group of people could legally form a “bank” and issue credit based on any form of collateral they saw fit to accept — the price of credit would fall to the labor cost of the paperwork involved in issuing and keeping track of it. As banking statistics reveal, this cost is less than one percent of principal (Tucker 1972). Hence, as Proudhon emphasized, a fee which covers this cost and no more is the only non-usurious charge a bank can make for extending credit. To refer to this legitimate cost-covering fee as “interest” is to confuse the issue. Anarchist banking would in fact reduce interest, that is, usurious fees for credit, to zero. Reduction of the interest rate to zero through mutual banking, along with an end to the State’s protection of titles to land not being occupied and used by its “owners,” would lower both profits and rents toward zero as well. Let’s consider profits first. Under mutualism, capitalists’ ability to extract surplus value from the labor of employees would be eliminated or at least greatly reduced, because many more workers than now would be able to obtain zero-interest credit and use it to buy their own tools and equipment, instead of renting them from capitalists at exorbitant rates. Although, at the start of the new system, not everyone would have enough collateral to obtain credit, many more people would be able to do so than now. This would result in a huge increase in the purchase of capital goods, which in turn would create a huge demand for labor. Such a demand would then raise employees’ wages toward equivalence with the surplus value produced by their labor. For this reason, workers would be able to save much more of their earnings than is presently the case, until soon virtually any person or group of persons, if they so desired, could accumulate enough wealth to use as collateral, obtain credit, and buy their own tools and equipment. In this situation it would be absurd for workers to pay someone else (i.e. a capitalist) more for the use of tools and equipment than a fee equal to their depreciation and maintenance costs plus the cost of the taxes (if any) and utilities involved in housing them. Then, as Tucker (1972) noted, an employee would be in a position to say to his or her employer: “Here, boss, you are a good business manager, and I am willing to continue to work under your superintendence on a strictly equitable basis; but unless you are willing to content yourself with a share of our joint product proportional to your share of the labor and give me the balance for my share of the labor, I will work for you no longer, but will set up in business for myself on the capital which I can now obtain on my credit.” With their vastly increased bargaining power, employees in this situation would be able to demand and get workplace democracy. Of course, on a purely individual level, a dissatisfied employee of the sort described above would be limited to starting up a relatively small-scale business that did not require a huge capital outlay. However, it’s important to emphasize that groups of workers could pool their mutual credit and start larger-scale collective enterprises. By a similar line of reasoning it can be shown that a zero-interest credit system, combined with an end to the State’s protection of titles to land not being occupied and used by those who claim to “own” it, would lower rents toward zero as well — that is, toward equivalence with the maintenance, utilities, and other costs absorbed by the owners of rental property. But these are not the only social benefits that would accrue from mutual banking. Other positive effects would be the elimination or alleviation of the business cycle and of the tendency toward high inflation, both of which are largely attributable to the current “fractional reserve” method of expanding the money supply for political purposes. In addition, mutual banking would greatly reduce the financial pressure responsible for much of the current “grow-or-die” philosophy of business, which is destroying the biosphere. Contrary to popular belief, when a commercial bank makes a so-called “loan” it does not actually allow the “borrower” to use a sum of money that the bank already possesses on deposit (the usual meaning of “to lend money”). What it actually does is to create new money, as credit, by the process of fractional reserve banking — a process in which only a certain fraction of the newly created credit-money (usually between 10 and 20 percent) really exists in the bank’s reserve account at the central bank. The rest of the “loan” is created out of thin air, simply by the bank’s crediting the account of the customer for the amount “borrowed” (Rothbard 1983; Greider 1987). We should not be surprised to learn, then, that the fractional reserve banking system actually originated as a form of fraud. Here’s the story. In the days before banks of deposit existed, people often placed large amounts of gold in the vaults of goldsmiths for safekeeping. The goldsmiths would then issue warehouse receipts for the gold, which were used by their holders as a form of paper money that could be exchanged for real gold by anyone presenting them to the issuing goldsmith. However, many goldsmiths soon began issuing fake warehouse receipts for more gold than they actually had in storage, and “loaning” them at interest to “borrowers.” This scheme worked quite well unless there was a run on the vault — that is, too many holders of arehouse receipts presenting them at one time for redemption — which clearly revealed the fraud, whereupon the goldsmith was usually taken out and hanged. The fractional reserve system of modern commercial banks, in which enormous amounts of interest-bearing credit-money are pyramided on a small base of “reserves,” is a direct descendent of this fraud. In essence, commercial banking is a giant Ponzi scheme, differing from the old goldsmiths’ racket only in the fact that it has been legalized by a series of unjust court decisions which gave bankers the exclusive privilege of issuing fake warehouse receipts for something they don’t actually possess. The injustice of these decisions is apparent from the fact that the writing of fake warehouse receipts for other types of goods — for example wheat (receipts for which have also been used as money) — is still subject to criminal penalties. Fractional reserve banking is highly inflationary because the vast majority of the money in circulation exists in the form of interest-bearing credit, created when banks make fractional-reserves “loans,” particularly to their large corporate customers. (In fact, every dollar in circulation is interest-bearing at its point of origin, since even currency must be backed by government securities.) Since all money thus represents an interest-bearing debt, every business that has “borrowed” to finance its operations must scramble madly to pay back the interest it owes by gathering profits from a pool of total dollars that is necessarily insufficient to repay the total principal and interest outstanding at any particular time. This fact obviously constitutes a strong incentive for such businesses to raise their prices and also to expand. For unless there is sufficient growth, indebted companies won’t generate enough profits to continue financing their debt. Indeed, many investors seek out highly indebted companies as likely high-growth investments. Moreover, corporations must also satisfy stockholders, who demand high growth in order to raise the value of their stock. Like the capital-goods and landlordist monopolies, the stock market depends on the State’s creation of an artifical scarcity of credit, which makes it necessary for corporations to sell stock in order to raise funds to finance their operations (thus incidentally placing companies under the control of absentee owners). Under mutual banking, however, the easier availability of credit will make this practice unnecessary, or at least greatly reduce its importance. A further inflationary pressure — perhaps the main one — occurs because central government finance their deficit spending by, in effect ,printing the money they need to pay their debts, a practice that increases the money supply. This is done by issuing new interest-bearing securities, which of course puts such governments even further in debt, leading to the printing of even more debt-money, and so on in a vicious circle. Fractional reserve banking is also a major contributor to the business cycle, simply because Ponzi schemes have an inherent tendency to collapse when public confidence in them is weakened for one reason or another. This is why recessions and depressions in the past were often triggered by bank runs — which is to say, when the “inherent bankruptcy” of certain banks was discovered by the public — whereupon all banks would begin calling in their old loans and refusing to make new ones in order to increase their reserve base, fearful that their own insolvency would also be discovered. Today, deposit insurance has largely eliminated the problem of bank runs; but other reasons still exist for banks to contract credit from time to time. The result is a “credit crunch,” which shrinks the total pool of available money from which funds for loan repayments can be gathered by businesses, thus producing a wave of business bankruptcies. Such a wave causes many weak banks to fail as their bankrupt business customers default on loans, which in turn causes the remaining “solvent” banks to tighten their credit even further, producing more business bankruptcies, further bank failures, and so on, until eventually there’s a full-blown recession. Some Libertarians (e.g. Rothbard) have proposed as a solution to such problems that currency be returned to the gold standard; that banks be required to maintain a 100 percent reserve of gold or paper currency redeemable in gold as backing for all extensions of credit; and that the central bank be eliminated in order to increase competition among banks (which, among other things, would lower interest rates.) Unfortunately, however, although this proposal would probably do some good, it still fails miserably as a solution to the major problems of exploitation which arise from the State’s creation and protection of a financial monopoly. For consider: Since gold is a naturally scarce commodity, and since the State would require that this scarce commodity be used as the basis of all money, the power to issue credit and currency based on gold would still be monopolized by a financial elite — namely those who monopolized gold. As Greene (1919) points out, the history of gold-standard banking in this country demonstrates that gold is one of the easiest commodities to monopolize, especially with the State’s help. But any financial monopoly, whether based on gold or not, will give rise to further monopolies of capital goods, land, and buildings. Moreover, although interest rates might fall under the system Rothbard proposes, they would certainly not fall to zero. Hence the three forms of usury previously discussed — interest, profits, and rents — would continue, though perhaps at a somewhat lower rate. In fact, right-wing Libertarians such as Rothbard never suggest that the fundamental mechanisms of economic exploitation, i.e. the goon-squad functions of the State, should be dismantled. Rather, they wish merely to “limit” the State to its “classical” role of performing only goon-squad functions — a role in which it would not get into the further businesses of providing social welfare, building roads and bridges, educating people, protecting the rights of workers, etc. In other words, Libertarians propose that the activities of the State should be confined entirely to protecting those key monopolies which allow the racketeering elite (i.e. bankers, capitalists, and landlords) to continue robbing and enslaving the rest of the population. Thus, in order to find proposals that strike at the heart of capitalist exploitation, we must turn instead to the ideas of libertarian socialists, and especially to the idea of a zero-interest credit system of the type first set forth by Proudhon. 2. In an article in the Nov. 26th issue of The Economist it is stated: “The transformation of the Internet from a huge virtual community into a huge virtual economy may herald the age of electronic money — and with it, headaches for traditional banks and regulators.” What the article does not state is that “e-money” is potentially a means of destroying the monopoly-capitalist system as we know it. For the lynch-pin of that system is finance-capital’s monopoly of the power to create money as credit. Since it doesn’t charge interest — the source of regular banks’ profits — and since its purpose is to provide economic assistance to the community, it may be possible to charter this new financial institution as a nonprofit charitable organization. In order to get non-profit status, however, it is essential that mutual-credit organizations not be officially described as “banks” “thrifts,” “savings and loans,” “credit unions,” etc., which would make them subject to the charter laws governing such institutions. For convenience I’ll refer to an anarchist zero-interest credit-issuer as a “mutual barter clearinghouse” (or just “clearinghouse” for short). Other semantic expedients regarding the official description of its operations may also be necessary in dealing with the State. The clearinghouse is organized and functions as follows. Members of the original barter association are invited to become subscriber-members of the mutual bank by pledging a certain amount of property as “collateral” (referred to by some other term — perhaps “pledge” is good enough). On the basis of this pledge, an account is opened for the new member and credited with a sum of mutual dollars equivalent to some fraction of the assessed value of the property pledged. The new member agrees to repay this amount plus the cost-covering service fee by a certain date. The mutual dollars in the new account may then be transferred through the clearinghouse by using a barter card, by writing a personal check, or by sending e-money via modem to the accounts of other members, who have agreed to receive mutual money in payment for all debts. The opening of this sort of account is, of course, the same as taking out of a “loan” in the sense that a commercial bank “lends” by extending credit to a borrower in return for a signed note pledging a certain amount of property as security. It’s like fractional-reserve banking in this respect. The crucial difference, however, is that the clearinghouse does not purport to be “lending” a sum of money that it already has, as is fraudulently claimed, with much hand-waving and doubletalk, by commercial banks. (Hence the creation of mutual credit does not have to be officially described as “making a loan.”) Instead it honestly admits that it is creating new money in the form of credit, but charging no interest for doing so. New accounts can also be opened simply telling the clearinghouse that one wants an account and then arranging with other people who already have balances to transfer mutual money into one’s new account. But whereas ordinary barter dollars are created at the same time that a barter transaction occurs and are used to record the values exchanged in that transaction, mutual barter dollars are created before any actual barter transaction occurs, being intended to facilitate future barter transactions. This fact is important because it can be used as the basis for a legal argument that clearinghouses are essentially barter associations rather than banks, thrifts, or credit unions, and therefore should not be subject to the laws governing the latter institutions. Unlike fractional-reserve banking, a mutual credit system will not create money by pyramiding fake interest-bearing “warehouse receipts” (i.e. Federal Reserve dollars) on top of a small base of “reserves.” Moreover, it will not be used by the State to print money to cover deficit spending. Therefore mutual banking will eliminate the current system’s contribution to both inflation and the business cycle. Nevertheless, critics may object that the easier availability of credit in the mutualist system would still produce a tendency toward inflation. In reply, we must consider the complete economic context of the proposal under discussion. This context is a network of worker-controlled productive enterprises. As mentioned earlier, mutualism will empower workers, who will gradually establish an economy based on firms practicing workplace democracy, self-management, and collective ownership. Hence we can assume that productivity will be much higher among the highly motivated worker-owners and self-managers in the new economy than it will be among the bored, apathetic, and resentful wage-slaves of the capitalist economy — who will continue to engage in featherbedding, high absenteeism, slowdowns, sabotage, strikes, and so on, just as they now do. Therefore, in the alternate system there will be more goods and services available in relation to the amount of credit-money that has been “borrowed” into circulation to finance start-up and production costs. This will have a deflationary effect on prices, offsetting inflationary tendencies that might emerge from the easier availability of credit. Moreover since the clearinghouse charges no interest on the credit it extends to members, worker-owners who have borrowed to finance start-up or production costs will be under far less pressure to raise their prices than capitalist owners who have borrowed from commercial banks at high rates of interest. As noted already, reduction of this pressure will also lessen the incentive to expand, with obvious environmental benefits. Worker cooperatives, which the new system will promote, have the further advantage of typically growing at a slower rates than capitalist firms, as several studies have shown (see Levin 1984 for a bibliography). Hence mutualism is an essential ingredient in the type of “steady-state” economy advocated by eco-economists. To quote Greene (1919) again, once a mutual credit system gets started in any part of the country, it will inevitably spread to all parts, until eventually it overwhelms the old system. This is because money and credit will periodically become scarce (or more accurately, scarcer) in the mainstream economy during recessions and depressions; hence at such times many people will start using mutual money simply in order to survive. But once they perceive the many advantages of the new system –e.g. low inflation, high employment, no recessions, high incomes for orkers, and an automatic, equitable redistribution of wealth — word will spread and others will join the system by a ripple effect. Mutual clearinghouses do not lend money, they create it Money lenders often claim that interest is their compensation for postponing the use of the money they lend. This is often raised as an objection to the claim that interest rates would fall to zero in a mutual-credit system. “People would still want compensation for postponing the use of their money, even if there were mutual banks, so interest rates could not fall to zero,” it is alleged. Such an objection reveals a misunderstanding of what a mutual bank or clearinghouse does. The “compensation-for-postponing-use” justification for charging interest is not available to such an institution, because it does not actually lend anybody’s money. Instead it creates new money, as credit, by monetizing the credit recipient’s collateral. This new money does not belong to any of the clearinghouse’s depositors, nor is it “based on” or “backed by” a portion of the money of any of those depostors. In this respect a mutual-credit system is unlike the current fractional reserve system, where a certain portion of despositors’ money is held in “reserve accounts” at the central bank. Since mutual credit-money does not exist prior to its creation by the clearinghouse, no depositors have to “postpone the use” of any of their money when the clearinghouse extends credit. Nor does the clearinghouse itself have to forego the use of any money that it has on its books. This is one reason that it will charge only a small service fee to cover the cost of the labor involved in issuing and keeping track of credit, plus other overhead. Once a clearinghouse is up and running, the government can be expected to step in and try to kill it. Chartering clearinghouses as nonprofit charitable organizations is admittedly a best-case scenario. But of course there is no guarantee that it will be possible in this way to circumvent banking laws whose purpose is to prevent the threat to commercial banking that schemes such as mutualism represent. Nevertheless, even if clearinghouses are not able to obtain nonprofit status, they may still be able to function legally as barter associations of a special kind. Besides the fact that mutual dollars are actually a variety of barter dollars, another factor on which arguments for their legality can be based is that they are not circulated as tangible monetary tokens (i.e. coins or bills). The attempts of earlier American anarchists to start mutual banks were quashed on the grounds that their currency violated legal-tender laws. However, this was before the days of credit cards and electronic credit transfers. As we’ve previously observed, some barter organizations today already use barter cards to transact business in barter dollars — a practice that is certainly close to what is being proposed here. So far the IRS has not been able to suppress the use of barter dollars, but has merely insisted that barter-dollar income be reported for tax purposes in the same way as regular-dollar income. Mutual-dollar income is arguably in the same category. But even if a mutual barter clearinghouse does manage to get established, it would be a mistake to believe that the banking industry would take this threat lying down or that it might fail to use its tremendous political clout in an attempt to destroy the new credit system through legislation. No doubt we’ll then witness a barrage of propaganda and scare tactics designed to convince people that mutual credit is “unsound” and “unsafe,” and therefore should be outlawed. There are a number of strategies that can be used to respond to this challenge. For one thing, as many idealistic lawyers as possible must be recruited to the anarchist cause. Although cynics may be inclined to regard the phrase “idealistic lawyer” as an oxymoron, a few such beings are rumored to exist in legal-aid clinics, government regulatory agencies, extra-governmental watchdog organizations, and even private practice. (Clarence Darrow, for example, was an anarchist.) Sharp legal minds can help organize test cases, court challenges, and efforts to repeal any obstructive laws that may be passed. For another thing, anarchists will be ready to engage in civil disobedience by ignoring any obstructive laws that may be placed in their way. So, while legal efforts are being mounted in its defense, the alternate economy can still function as an underground system. As Morris and Hess (1975: 73) report, unlawful underground credit systems already exist in many ghetto areas, based on funds collected through illegal gambling. In such systems, many of the small stores in the area take bets and use the cash profit to extend credit to the large welfare population. In addition, “the numbers runners and controllers are known to lend funds to their better customers who are temporarily short on funds (and the custom is that the loan is interest-free).” It would appear that if an underground zero-interest credit system based on organized crime can maintain its existence in statist society, a mutualcredit system organized by an ethically motivated radical community that has widespread public support and employs a variety of mass direct actions to defend itself stands an even better chance of maintaining its viability against State attempts to suppress it — particularly now, with the advent of e-money, which can be transferred using encryption codes that will make such transactions extremely difficult to trace. Here’s a short article from Mary Hansen on socialism and the idea of social organism. This is from the issue for Sunday, February 23, 1902 (Vol. IX, No. 8, Whole No. 350), right-hand column of p. 3. That he who uses the social organism analogy does not see clearly, seems plain to me at least. A few weeks ago a prominent Socialist stood before an audience, and by way of proving social interdependence asked: Now if I were to cut off or injure these fingers would not my whole body suffer?” Yes! and following the same line of reasoning, if you injure half your organism the rest would suffer, and this under any circumstances. Now, if society were an organism, the same would be true of it, yet we do not find it so, since the injury done at present to the greater half of society only serves to increase the luxury of the other. The more workers there are willing to starve on small wages and accept any injury, peaceably, that is caused by the avarice of their employers, the greater the profit and comfort of said employers, and the government officials, who could grow fat at leasure. Surely it would be difficult to show where the injury to society touches them. Hansen was a Danish-American Anarchist who was (along with Voltairine de Cleyre, Natasha Notkin, and others) a regular participant in the Philadelphia Social Science Club and the principal author of the Club’s classic pamphlet A Catechism of Anarchy . Free Society was published in Chicago but became a major venue for many of the Philadelphia Anarchists. Here’s an exchange from Free Society on liberty, trusts, and state socialism, from February 1902, between G. E. Lind and R. W. (presumably Ross Winn). 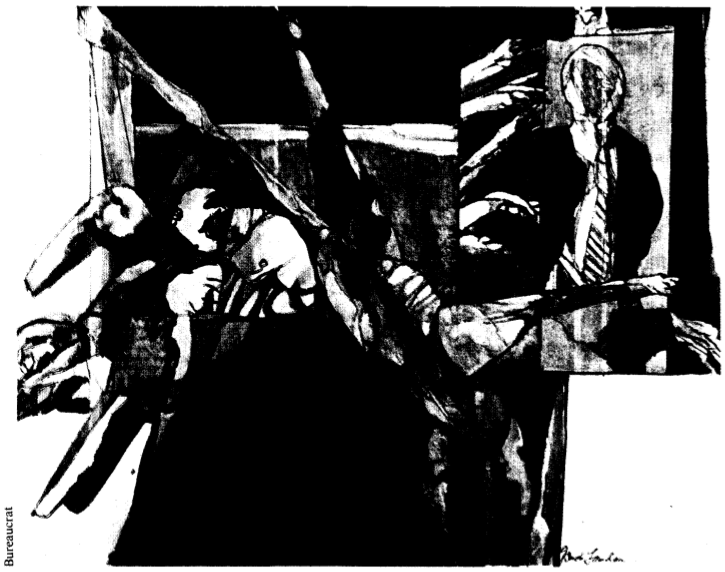 The exchange appears in Free Society Vol. IX, No. 7, p. 3. When the economic development had transformed the social relations of the past into a state of society in which the material interests of one class of individuals became diametrically opposed to the material interests of the other class or classes of individuals, there naturally appeared various economic classes which in order to preserve themselves they were compelled to avail themselves of every opportunity in the struggle for supremacy which ensued. Therefore it was but natural that the class which had secured economic supremacy should make some claim to divine authority and the right to govern the economically inferior, while at the same time claiming to protect society. All this was done in order that the class which had attained economic supremacy might perpetuate its existence as rulers and exploit the economically inferior more successfully, hence the appearance of the State or government, which the Anarchists talk so much about, but understand so little. (1) Then the State is simply an effect instead of a cause, hence the absurdity of advocating the “abolition of the State without abolishing the class struggle which is the cause of the State. (2) Anarchism declares war on the State, which is just as nonsensical as the Democrats smashing the trusts, etc. Socialism would not smash the trusts or declare war on the State, but will absorb the State, and by so doing will absorb the trusts(3) and all the instruments of production and distribution, the result of which would be the abolition of economic classes and consequently the abolition of the oppressive capitalistic State, and the inauguration of the cooperative commonwealth. But it was the Anarchists who first traced the origin of the State to the existence of a privileged class, and demonstrated that the perpetuation of the privileged class is the inevitable result of the State–its raison d’etre. We prove that privilege is only possible thru the support of the State, and that the abolition of the State is necessary to eliminate privilege. If, as you contend, the class struggle is the cause of the State’s existence, and you wish to abolish the class struggle, you are simply taking another line of reasoning to reach the same objective point–viz., the abolition of the State, which you say is impossible. You appear to be slightly mixed–not an uncommon phenomenon with State Socialists. By establishing the most gigantic trust conceivable–a State monopoly. It is not the forms of monopoly that are evil; but its essence–the principle that abrogates liberty–that sets bounds upon the play of social activity. But your cooperative commonwealth, administered by State officials, will have society divided into two classes–the workers and the governmental directors of industries. The State boss with unlimited power, will constitute a class, and consequently the cooperative commonwealth will not abolish the class struggle. You seem to be in a fair way to explode the fallacies of your own philosophy. — Free Society: A Periodical of Anarchist Work, Thought, and Literature , Vol. IX, No. 7, Whole No. 349 (February 16, 1902). Chicago: A. Isaak, publisher. 3. This is an item from The Egoist , an individualist anarchist paper published by Edward H. Fulton under a series of at least five different names from 1919 to at least 1928, which provided a major forum for plumb-line individualist anarchists, American mutualists, and many former members of Tucker’s Liberty circle during the 1920s. (The paper, for example, provided a new home for Jo Labadie’s Cranky Notions columns, published articles by Austin Wright, Clarence Lee Swartz, Henry Cohen, etc. The periodical began as The New Order (1919), was changed to the 1776 American in 1920, changed to EGO in 1921, went on hiatus for a few years, and then reappeared as The Egoist in 1924. After this issue, Fulton, based on reader responses, changed the title again to The Mutualist , which ran from 1925 until at least 1928. This article appeared at the back of The Egoist IV.6, on page 7 (July 1925). The most liberal supporters of this paper, some of them egoists, have asked me change the name of the paper. John Basil Barnhill was the first to suggest a change. I refused. (See No. 4). Many others have made the suggestion, because egoism refers to a moral doctrine and egoist is not generally understood as individualist, notwithstanding the Standard Dictionary, and others, define “individualist” as “an egoist.” I answered these friends that as I had used various names for small leaflets–names that would suit my only font of big type for change in size of paper–that another change might tend to give me the title of “nut” or “quick-change artist” in regard to names. But they still write urging change of the name–don’t think the name is appropriate for a individualistic discussing political, social and economic matters almost exclusively. If no one objected to the name, The Egoist, I would make no change, (as no name would compel me to pay an income tax), but some of my best friends want another name–most ANY OTHER name–for the paper. I am not obstinate on immaterial things, so will put the matter up to subscribers. Any name chosen by subscribers will suit me–BUT IT MUST STAND AS LONG AS I LIVE–I hate changes, notwithstanding many publications I see have little red or blue lines below a big new name saying “Formerly, etc., etc.” [“Fawcett’s,” formerly “True Confessions”; “Tax-Payers’ Magazine,” formerly “The Yeoman” for example]. Arthur R. Woolsey suggests the modern style–an engraved heading, “FULTON’S” in large letters, with “Magazine” in small letters beneath in an ornamental extension. None of the new names were chosen or suggested by me. I am leaving the selection to subscribers. Send first, second and third choice. ANY of these names will suit the publisher. Yesterday’s post mentioned Justus Schwab, a German-American radical and a fixture of the New York Anarchist milieu, who kept a radical “Beer-Hole” on First Street where Anarchists, socialists, writers, artists, and other radicals and misfits met to drink and talk into the night. Emma Goldman later described his saloon as “the most famous radical center in New York.” Here is an item from the December 21, 1900 issue of the New York Times , on Schwab’s death and his funeral, which brought together New York radicals across factional lines and putting aside schisms and personal breaks to celebrate his memory. Anarchists Forget Their Differences at His Funeral. The Tribute of John Swinton–Most in Tears–Emma Goldman Looks Calmly On. The disciples of extreme Socialism and Anarchy in this city were assembled in harmony yesterday under one roof. This, it is declared, is without a precedent. The occasion was the funeral of Justus Schwab. The Anarchists gathered in a dingy hall on East Fourth Street. All differences were forgotten, and there was not a single man or woman who gave evidence of any feeling other than sorrow at the loss of the dead disciple. At times during the speeches which were made over the body almost every one there broke down and wept. Dark, bearded faces that had worn a scowl of discontent for years were softened with grief, and men who had been bitter enemies of Justus Schwab while he was alive cried like children. Emma Goldman, the woman Anarchist leader, who had been the dead man’s closest friend, was the only one present who did not give some indication of emotion. She sat calmly throughout the ceremonies, although John Most, who had been opposed to Schwab for years, gave way completely to his grief several times. The funeral services were held in the assembly room of the Labor Lyceum at 64 East Fourth Street. The body was taken from the room over the saloon at 50 First Street, where Schwab had lived, early in the day and placed on a bier in the middle of the assembly room. The coffin was open so that the face of the dead man could be seen, and coffin and bier were draped with flags. The emblem of Anarchy was wrapped around the coffin and thrown over the lower part of it, and flags from various labor unions hung below. There was a pile of flowers that brightened up the dark hall, arranged on a table at one end. There were wreaths from Cigar Makers’ Union No. 90, from an Italian Anarchist society, and from the Social Science Club. The funeral service was marked by the absolute absence of any religious ceremonial, and consisted of speeches by various friends of the dead man. The band of the Carl Sahm Club, which was stationed at one end of the hall, played a dirge that seemed to harmonize with the sombre surroundings, and the Lieber Tafel Singing Society, which the dead Anarchist had founded, sang Eventide. George Biederkapp, the author of a book of Socialist poems, recited an original poem eulogizing Schwab, entitled, The Storm Has Passed, and when he had taken his seat almost every one in the room was in tears. Alexander Jonas, a Socialist leader, made a short speech in German and was followed by John Swinton, who spoke in English. I am entirely overcome, he said, when I attempt to speak of our dead brother. I have never known a man so self-sacrificing, so faithful, so noble. John Most, who had been the leader of the Anarchist faction opposed to Schwab, was the next speaker. He spoke in German and in the most dramatic manner. When he had completed his speech he was evidently exhausted, and sank into a chair as the pall-bearers lifted the coffin and carried it out to the hearse, which was waiting for it. As the hearse started slowly down Second Avenue, followed by a few carriages, nearly 2,000 people, many of them in tears, fell in line behind it. The procession passed by the little saloon where Schwab had lived and then proceeded slowly to the ferry at the foot of East Houston Street. All along the route the windows of the tenements were filled with people. At the ferry the carriages followed the hearse and the Anarchists on foot dispersed quietly. The body was taken to Fresh Pond, L. I., for cremation. 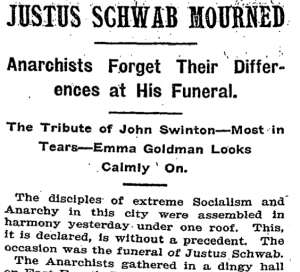 PDF: “Justus Schwab Mourned,” New York Times (December 21, 1900).